The Mohawk-Hudson Section of The American Society of Civil Engineers was established in 1938. In 1976 the Mid-Hudson Branch was established. 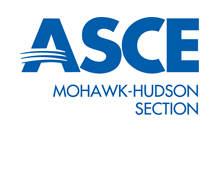 The Section serves ASCE members and their communities within twenty three New York State counties. Join Today and Find Your HOME at ASCE. The American Society of Civil Engineers was founded in 1852. The American Society of Civil Engineers (ASCE) represents more than 146,000 members of the civil engineering profession worldwide and is America's oldest national engineering society. For 2016-2017, the Society's Board of Direction is lead by Norma Jean Mattei, Ph.D., P.E., F.SEI, F.ASCE, 2017 President, Mark W. Woodson, P.E., L.S., D.WRE, F.ASCE, 2016 President , and President-elect Kristina L. Swallow, P.E., ENV SP, F.ASCE. Executive Director and Secretary Thomas W. Smith III, ENV SP, CAE, F.ASCE, leads the Society's 250 staff members. ASCE's membership is organized into nearly 400 local affiliates, which include 75 Sections, 158 Branches and 130 Younger Member Groups. Facilitate the advancement of technology to enhance quality, knowledge, competitiveness, sustainability, and environmental stewardship. Encourage and provide the tools for lifelong learning to aid our members' continued growth throughout their careers. Promote professionalism and the profession throughout society to enhance the stature of civil engineers and to influence public policy. Develop and support civil engineer leaders to broaden our members' perspectives, enhance their career growth, and promote the public interest. Advocate infrastructure and environmental stewardship to protect the public health and safety and improve the quality of life.